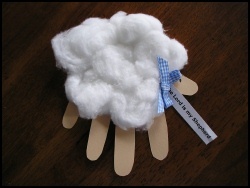 Young children will love to make this classic sheep Craft. Instead of black paper, I like to use brown, peach or pink paper for the sheep's 'body,' that way you only need a marker to draw on the sheep's eye, instead of white paint or pen. You can leave your sheep plain, or add a "The Lord is my Shepherd" tag around around his neck for a great Sunday School craft! To make it easier, make the sheep's bow and "The Lord is my Shepherd" tag before hand. If you're doing this craft with toddlers, you could trace and cut out your own hand print, they'll love to glue everything else! 1.Trace a hand print onto your colored paper and cut out. Glue cotton balls all over hand print, leaving the fingers and thumb bare. Don't forget to draw on your sheep's eye! 2.On a piece of white paper, write, "The Lord is my Shepherd," cut a hole at the end of the paper and thread through a small piece of ribbon. Tie the ribbon into a bow, just like you tie your shoe, and glue onto the sheep's neck.